This is a delicious, soft mess of a dish; adding parmesan to the roasting aubergines a few minutes before removing them from the oven and mixing them up gives luxuriant richness. Pre-heat the oven to high. In a roasting tray toss the aubergine slices in some olive oil and salt and lay flat. Add the peppers to the tray. After around 20 minutes remove the peppers when the skin is coming away from the flesh and has split. Continue to cook the aubergines until they are soft. 2 minutes before removing the aubergines spoon a small heap of parmesan on top of each slice, leaving some cheese over. Meanwhile, peel the red pepper, remove the seeds, tear or cut up, the flesh and place in a serving bowl. Remove the aubergine from the oven when the cheese is melted and bubbling. 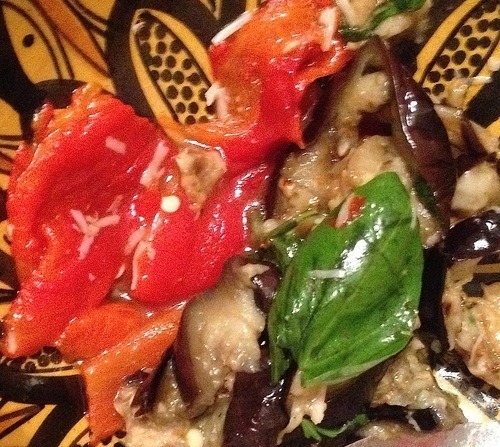 Slice the rounds of aubergine with melted cheese on in half and add to the peppers. While still warm, add in extra parmesan grating, tear in the fresh basil, squeeze in the lemon juice and a spoon of olive oil. Season with salt and a touch of pepper. Mix up.